freely on the marble floors of Deshnok temple in Bikaner, Rajasthan. 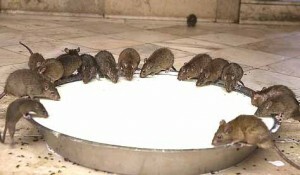 As I moved further into the temple I saw some rats were busy feasting on the prasad, some were sleeping peacefully in the corners and many of them were clumped on the edges of milk bowls. The views were truly overwhelming. They seemed not to be bothered by the presence of human beings. May be they knew how important they were in the eyes of people at this temple. The rats (locally known as Kabba) are considered holy at this temple and there is an interesting legend associated with it. It s believed that they are the incarnations of Karni Mata, the preceding deity of the temple. 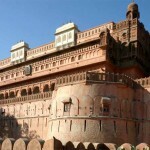 I had heard a lot about this unique Deshnok temple where around 20,000 rodents live a luxurious life. Sitting pretty and enjoying the food and respect offered by devotees who come to the temple, no wonder these rodents are no less than Raja-Maharajas. What luck! Deshnok Temple, also known as Karni Maa Temple, is an interesting holy site where rats are worshipped. This is 600 year old temple has a wire grill covering its courtyard to prevent birds from feasting on the holy rats. Not only this, the temple has holes and tunnels to facilitate the rats to move around freely. As I was heading to the main shrine, a rat ran over my feet. For a moment I felt quite uneasy. However, my uneasiness faded away when a devotee at the temple who had also seen that rat running over my feet walked up to me and said, “ You are fortunate as the sighting of a white rat in the temple is considered a blessing from the goddess”. She even told me that out of thousands of rats, there are only 4 or 5 white rats in the temple. And it is not easy to sight them. Wow! I felt great. The lady who told me about the white rat was from Deshnok village itself. I interacted with her and asked her several questions regarding the temple. One of the facts that left me speechless was that despite the presence of thousands of rats in the temple, Deshnok village never faced any incident of plague or any other rat borne disease. No wonder this is the magic of the goddess. «Next Post Close Encounter With the Majestic Predator!